I’m a bit of a nostalgist. I still like the Commodore 64. On the other pages are some games based on C64 games. This is non game stuff. 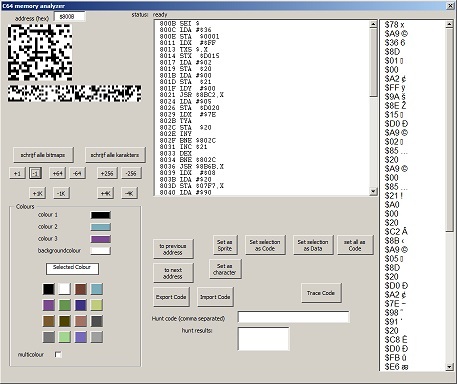 First one is a tool that uses as input a C64 memory dump (made by Vice for instance) and then shows the memory as code, sprite or character data. If you provide a start address the program will try to trace the complete code and create a text file of it. Would be nice to expand it some more and make it also see interrupt stuff as code. You can also export parts of memory as code and as character.